In my best television announcer voice: “Digital TV has better picture, better sound and more channels!” Unless you’ve been living under a rock then you have probably heard that a million times by now. 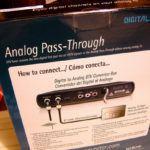 If you have been living under a rock then you need to check out the Digital TV 2009 website to learn more and to apply for a converter box coupon so you can watch free over-the-air digital TV on your analog televisions. 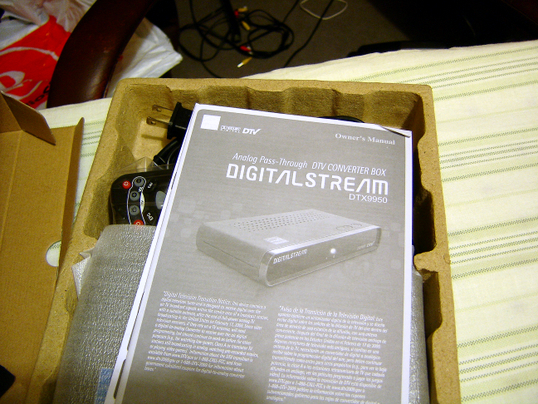 A couple of weekends ago I purchased my converter box, a Digital Stream DTX9950. I purchased it then because my coupon was soon to expire. 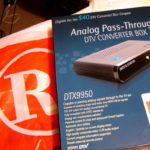 I knew several people who had already purchased their converter boxes. A couple of those people had purchased the Digital Stream brand. 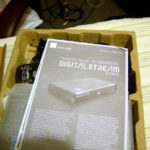 After looking at the Digital Stream, GE, Magnavox and RCA converter boxes online, I felt the Digital Stream box was to my liking as well. I had helped my Father and Grandfather with their converter boxes. My Father had the DTX9900 and my Grandfather had one from Magnavox. The one from Magnavox felt really cheap and the on screen display looked even cheaper. 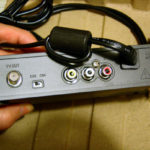 I had considered getting an RCA converter box but after looking at the reviews and some YouTube clips I felt it was cheap and poorly designed like the Magnavox. 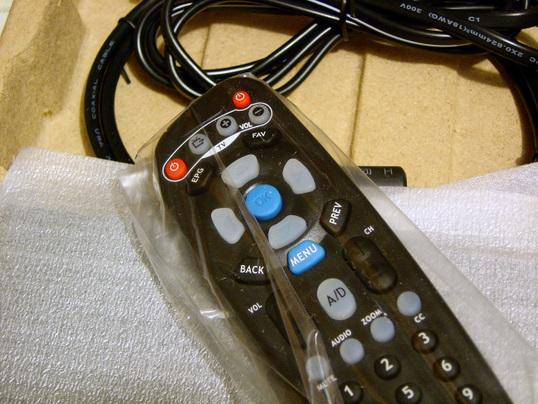 Almost all converter boxes are packaged with the same accessories: a very short RF cable, a remote with batteries, manuals and the converter box. 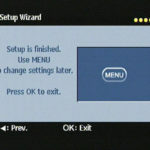 If you’re going to connect the converter box to your television or VCR the included accessories will be enough for you. 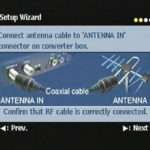 If you want to connect the converter box to your television using RCA cables (for better picture) you will have to purchase those separately. Setting up the DTX9950 is really easy. 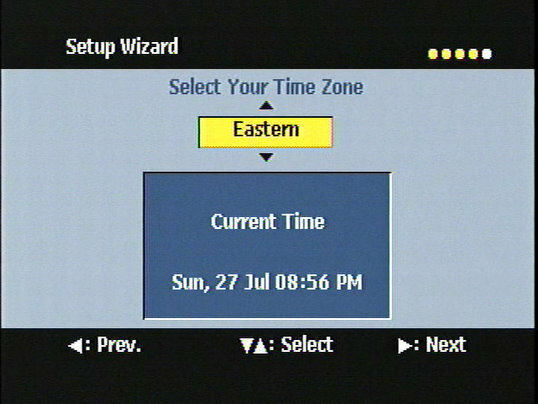 When you power the converter box on it will walk you through a setup wizard which consists of: language selection, confirmation of the cables being plugged in correctly, channel scan and time zone selection. After having the converter box connected I was able to pick up a lot more channels. 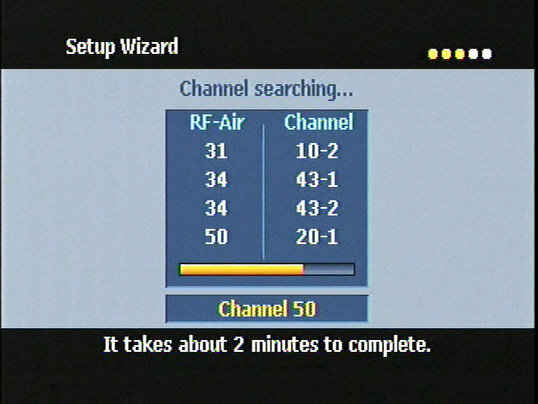 Before connecting the converter box most of the channels were snowy. I am a bit disappointed, though. I was hoping to be able to pick up even more channels. I use to get more channels on my indoor antenna than we got on the television in the living room which has an outdoor antenna. That has changed and I now get less than the antenna in the living room. 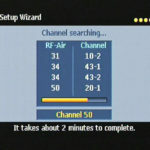 There are two channels I cannot receive and four more that if I move the antenna around I’m able to get but they are very weak signals. Two of which I was able to receive before connecting the converter box. If I move my antenna around I am able to receive them but they’re prone to cutting in and out. I’m probably going to have to purchase a better antenna to pick up anymore channels. The antenna I have now is 10 years old (the same age as the television) and is just an indoor antenna that’s not very strong so I’m not going to complain. However, I do get two channels that I did not get before. I just don’t get everything that an outdoor antenna can pick up. I just wanted to point out that you may need to get a stronger antenna to be able to receive more channels. The included remote works pretty well. I got it to work with my 10 year old 19″ RCA XL100. At first I could only get it to power off the television. 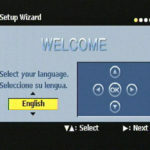 I first programmed the remote using the codes in the manual. I then used the code search function of the remote (hold down the TV power button and press the channel up button until the television powers off). Using the code search of the remote I was able to get it to power the television on and off. 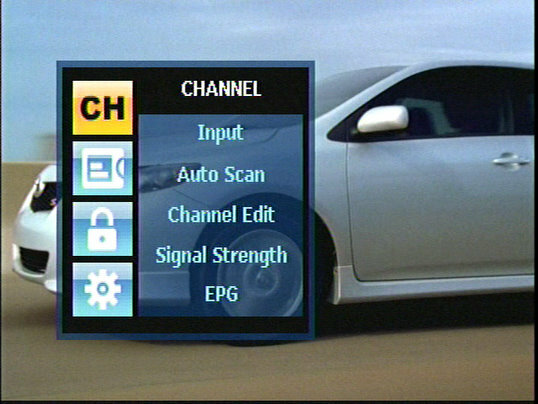 The remote only controls the power, volume and inputs of the television (switches between channels 3 & 4). The television we have in the living room has an older version of the Digital Stream converter boxes, a DTX9900. 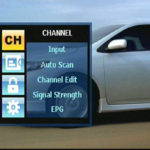 The only difference between the two that I have seen is that the DTX9950 has analog pass through which allows you to press a button on the remote and view analog broadcasts. 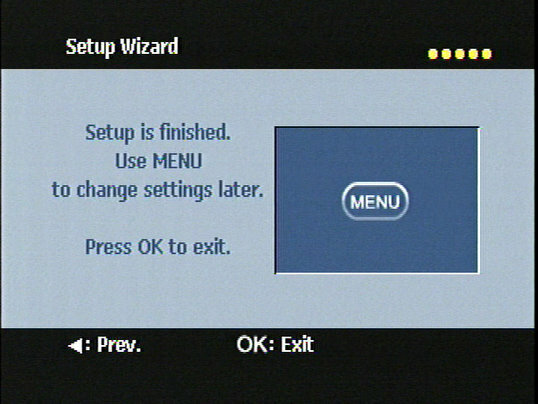 Pressing the button again switches you back to digital television. 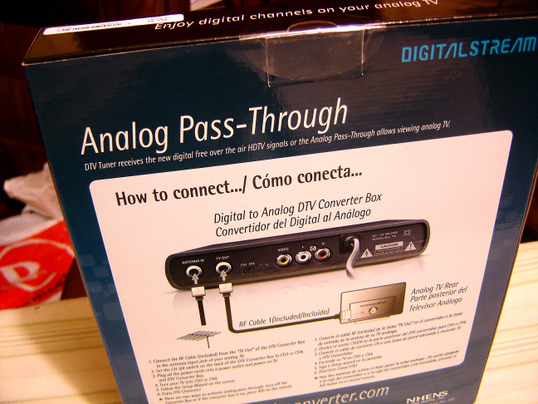 This is handy in circumstances that you can pick up a channel in analog format but not in digital. When the switch happens next February I don’t know how useful this feature will be, there may be some low power stations that are allowed to continue broadcasting in analog. 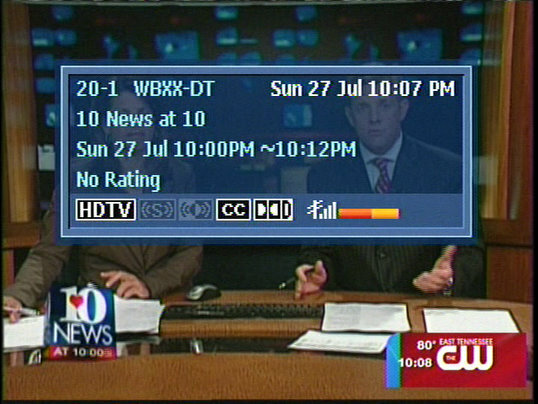 On the DTX9900 there is an “Info” button (instead of an analog pass through button) which brings up the program information for the channel you are currently watching. 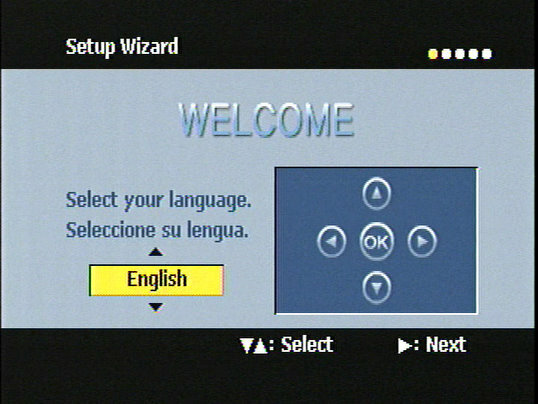 On the DTX9950 you can press the “OK” button to get the channel information to appear. 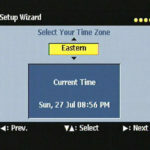 There is a button for bringing up the Electronic Program Guide (EPG) on both remotes. 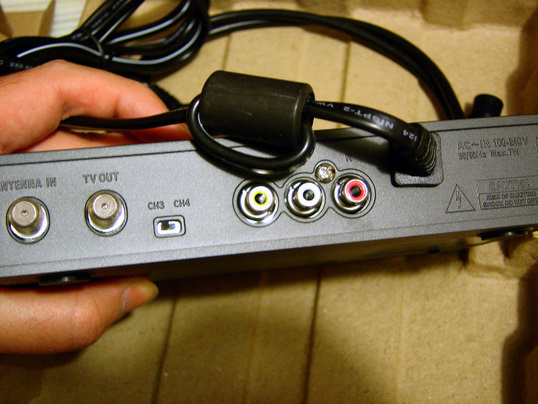 Note: Only digital TV signals will be sent through RCA cables. 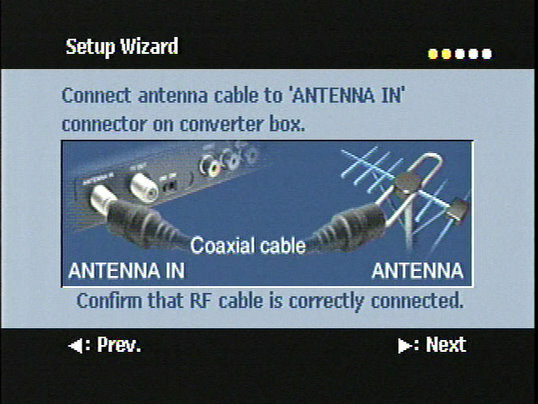 If you’re using RCA cables and want to watch analog broadcasts through the converter box you’ll have to use an RF cable. 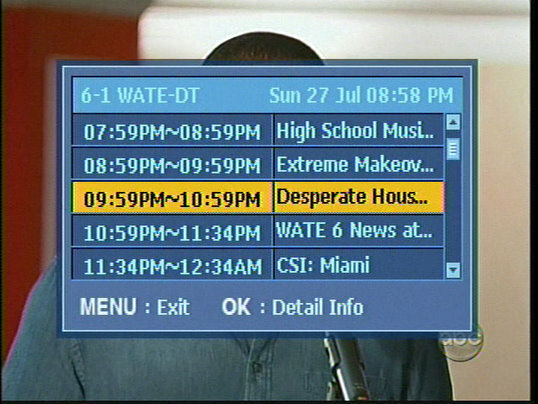 Speaking of the EPG, this is another really nice feature. 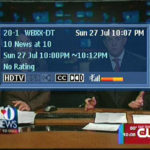 With the DTX9950 it seems that the program guide works really well and has a lot of useful information. Sometimes, more information than what is printed in the local newspaper television guide. I’ve noticed that there are some stations that have programming information for a couple of days and there are some stations that only have listings for the next few hours. Also, some stations have extended descriptions for upcoming programs and some don’t. Flashback: When I first got my RCA television the remote control had a program information button that sometimes displayed current programming information. Sometimes it would work, most of the time it wouldn’t. Hopefully, the EPG will work for the foreseeable future. 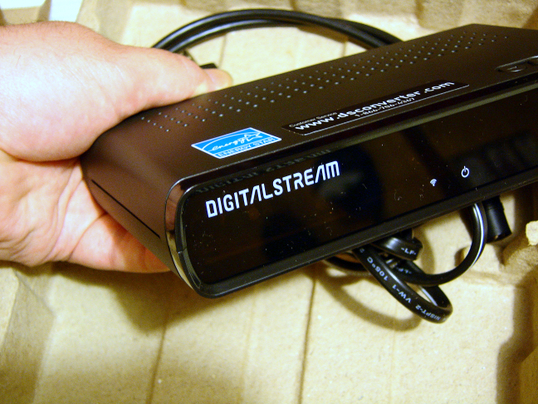 The Digital Stream and most other converter boxes allow you to take advantage of wide screen television broadcasts. If you have a wide screen television you’ll appreciate this the most. If you don’t have a wide screen television you’ll still appreciate this if you don’t mind letter boxing. I personally like it regardless of the letter boxing because it allows me to see a wider view. If you’re not a fan of the letter boxing you can zoom to fill the screen. You can also change to Anamorphic view which allows you to see the entire wide view in the frame. It doesn’t look all that great so I’d recommend sticking with the letter boxing or zooming. A couple of other notable features are the ratings and emergency alerts. If you have children and don’t want them to view inappropriate content you can set up ratings for acceptable viewing and assign a pin number to keep them from changing the ratings. I won’t go into how stupid I think this is but I will say that I’m sure there are ways around this. Most of the converter boxes, the Digital Stream being no exception, allows you to view emergency alerts. I have not saw one of these come across the television (hopefully I won’t anytime soon) but I am guessing these would be for Amber and other emergency alerts (fire, weather, police). I don’t fully understand how the alerts would work or be shown on the screen, if you know feel free to leave a comment. I have heard a lot of people say that they think this is a government conspiracy to get more money. I don’t agree with that. The government is freeing up the analog spectrum for other purposes and is giving you two coupons worth $40 each. The government doesn’t force you to watch television and they didn’t give you money to purchase your analog antenna or television. Besides that, digital television is truly a lot better in many ways. Speaking of costs. 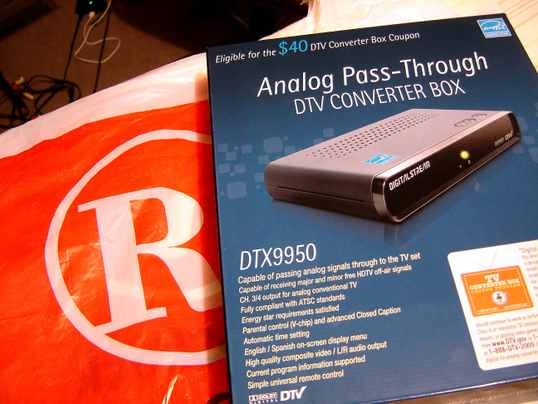 The DTX9950 from Radio Shack is $59.99 ($65.84 after tax in Oak Ridge, TN). You have to pay taxes on the coupon (maybe this is a government conspiracy). After the coupon and taxes were applied I paid $25.84 for the converter box. In conclusion I have to say I am very pleased with the DTX9950 (and the DTX9900). Like I have mentioned in this post already I think it’s one of the better converter boxes out there. I have read a lot of great things about it and in my experience with using it over the past couple of weeks I really do like it a lot. 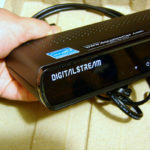 I think the features of the Digital Stream brand are far beyond those of other brands. I think it would be great if you’re someone like me who doesn’t pay for cable or satellite television and wants to receive free, local programming after the switch in February 2009. I could see this being used in campers for those who don’t want to sign up for mobile satellite television. 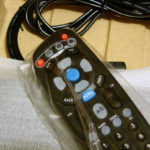 Check out the Digital TV 2009 website to learn more about the switch to digital, sign up for two free $40 coupons from the government and find out what programming you can receive in your area with a digital television converter box.